Shrek Out of Ten 2: The Shrekoning easily won the on-campus title of Lawrence University’s 49th annual Great Midwest Trivia contest held over the weekend. The Shrekoning racked up 1,398 points, finishing comfortably ahead of Bucky’s Banastitudinal Buggery Brigade, which placed second among 19 student teams with 1,232 points. David and the Bells Decisively and Terminally Bash Discordant Academic Teams by Dominantly Activating Technical Backstabbing, Dosing Amphetamines Triply, Breathing Deeply, and Trying Best finished a close third with 1,207 points. Twerking for Trivia out-twerked the 2012 champions Twerking Red Headed Iowans Violating Innocent Appletonians 1,300 points to 1,255 to claim the off-campus title from among 57 teams. Last year’s runner-up, Hobgoblin of Little Minds, dropped to third this year with 1,205 points. 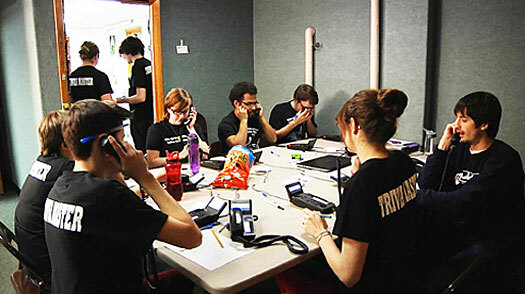 Volunteers man the phones for answers in the WLFM studios during the 49th annual Lawrence University Great Midwest Trivia Contest. Shrek Out of Ten 2: The Shrekoning received a non-functional bong made of 2-liter soda bottles while Twerking for Trivia was presented an empty bottle of liqueur filled with cream cheese, which the trivia masters smashed on the ground, as first-place prizes for their winning performances. A total of 416 questions were asked during the 50-hour contest, which ended at midnight Sunday. This year’s contest featured a theme hour devoted to first-year Lawrence President Mark Burstein. The irony is not lost on Addy Goldberg. The Lawrence University senior and self–confessed “very bad” trivia player finds himself overseeing the 49th edition of the nation’s longest-running intellectual scavenger hunt — Lawrence University’s Great Midwest Trivia Contest — despite never actually having played the contest. He joined elite company in the contest’s illustrious history by earning anointment as a trivia master as a freshman in 2011, a feat matched by few first-year students. After two more years as a master, he was thrust into the contest’s ultimate position as this year’s Grand Trivia Master. “I feel like I’ve been raised by it, because my introduction to the contest wasn’t through playing it or through witnessing it, but through running it,” said Goldberg, who doesn’t have any freshman among his 12 trivia minions. “I feel a lot of debt to the trivia masters who ‘raised’ me as the freshman who had no idea what was going on, which usually is not how it’s supposed to go. Q1. Who is the president of the micronation that fixed their currency to the cost of radishes in 2007? 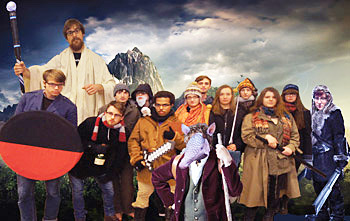 Under Goldberg’s direction, bragging rights to the title of this year’s 50-hour contest — last year’s battle royale of all things obscure drew 13 on-campus teams and 61 off-campus teams —kicks off anew at the precisely appropriately inconsequential time of 37 seconds after 10 p.m., Friday, Jan. 24 and runs continuously through midnight Sunday, Jan. 26. As it has since 2006, the contest will be webcast worldwide on the Internet at wlfmradio.com. Launched in 1966 as an alternative activity for students who didn’t participate in an academic campus retreat, Lawrence’s Great Midwest Trivia Contest is a 50-hour celebration of all things insignificant, with 400 Google-challenged questions of various point values asked every three minutes, sandwiched around off-beat humor and eclectic music while teams scramble to call in answers to a phone bank in the WLFM studios. Through its nearly half century existence, Lawrence’s trivia contest has enjoyed remarkable staying power, as Appleton in late January remains a destination point for many from around the country who return to the Fox Valley to reunite with friends and family for a weekend of fun and furious web surfing. Q2. Which American state includes the greatest number of governmentally established plantations? What’s the secret to the contest’s ongoing popularity? Goldberg, whose doctor got excited during a recent office visit when he discovered he was examining this year’s Trivia Grand Master, also credits an intertwining of communities for the contest’s longevity. The 2014 Great Midwest Trivia Contest trivia masters, led by Grand Master Addy Goldberg (upper left). Q3. Zebulon Pike once floated all the way from Toronoto to Sackets Harbor, New York. What was he floating in? Last year’s contest came to a clumsy conclusion when an on-campus team posted the answer to the final “Super Garradua” question on Facebook, prompting the trivia masters to cut short the time allotted to answer the 100-point question, preventing several teams, including the defending champions, from answering. This year’s contest will provide Lawrence President Mark Burstein with his trivia baptism. Following tradition, Burstein will have the honor of getting the 49th contest started by asking its first question, which, also by tradition, is always the final question — the Super Garruda — from the previous year’s contest. Q4. What three words are written in metal letters on the back wall of Cranky Pat’s in Neenah? What is usually an unanswerable question, last year’s Super Garruda proved to be anything but as seven on campus and 14 off campus teams managed to get the correct answer before the contest was called prematurely. The public is invited to a community open house of the new studios of WLFM, Lawrence University’s campus radio, Saturday, Jan. 14 at 8 p.m. WLFM staff members will offer tours of the remodeled facility and give demonstrations of some of the newly installed equipment. WLFM converted from an over-the-air FM signal to an all web-based broadcast format last fall. This year marks the 50th anniversary of the station’s founding. As part of the open house, a concert featuring the Lawrence student band 8bitbEtty, the Chicago-based band Piglet and the three-member group El Oso from Milwaukee will perform in Cloak Theatre beginning at 9 p.m. The WLFM studios are located on the lower level of the south end of the Lawrence Music-Drama Center, 420 E. College Ave. Nothing Trivial About This Birthday: Lawrence University’s Marathon of Minutia Turns 40! Back when a first-class stamp set you back a nickel and the Beatles’ “We Can Work it Out” was tearing up the pop charts, Lawrence University student J.B. deRosset decided he would try to build a better mouse trap. While no mice were ever caught with deRosset’s creation, he did manage to ensnare a generation of college students who, for the past 40 years, have turned matters of minutia into an annual 50-hour artform of outrageous questions and answers. 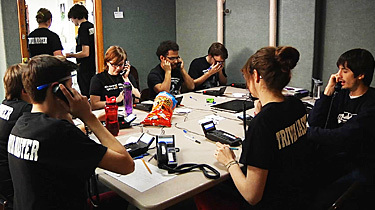 Welcome to the 40th edition of Lawrence University’s Great Midwest Trivia Contest, the nation’s longest-running salute to the obscure and inconsequential, where first-place prizes like toilet seats and bags of Ramen noodles are revered as badges of honor. In honor of the contest’s 40th birthday, deRosset, who holds near cult-like status among Lawrence trivia diehards, is returning to the scene of the crime, flying to Appleton from his home in Miami, Fla., to spend the weekend as the contest’s guest of honor. It was the dead of winter of 1966 when deRosset, then a senior at Lawrence, began plotting how to improve an idea he stumbled upon while visiting a woman-of interest who was attending Beloit College at the time. With the help of two friends who worked at the campus radio station at the time, deRosset started tinkering. The first contest — only 26 hours long — hit the airwaves in May of ’66, coinciding with Lawrence’s annual “Encampment Weekend,” an academic retreat in which select students and faculty members headed off to discuss issues of great importance. deRosset engaged those students who were left behind in an intellectual battle of a different sort, asking them to call in answers to esoteric questions asked during the course of a radio broadcast. The team that answered the most questions correctly received a fitting prize for a contest of this ilk: an old refrigerator filled with 45 rpm records. Forty years later, the Internet has altered the trivia contest landscape — computers and laptops with high-speed network connections have gradually replaced mountains of almanacs, encyclopedias and reference books as the “weapons of choice” — but the spirit of the contest retains much of its original verve. At the time, deRosset had no idea his idea would have such staying power. But with the perspective of 40 years, he’s not entirely surprised, either. “We had such great camaraderie that it was simply a blast that winter of 1965-66 putting together the concept and working on the details,” said deRosset. “I have to believe the same is still true today, even if the academics sometimes get in the way. It is sort of like playing football for USC or the University of Miami, but without the large payoff or the disabling injuries. From “Frying Nemo” and “Apocalypse Cow” to “Smarter Than the Average Bush,” creative, often outrageous and sometimes borderline offensive team names add a playful dash of fun to the weekend. 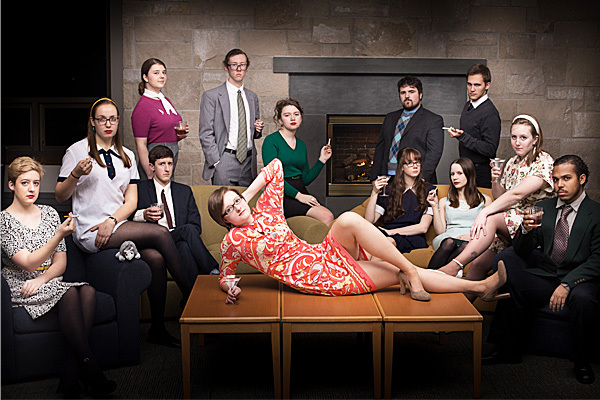 Playing this year as The West Bank of Kaukauna Concealing Weapons of Mass Deduction, a team of several dozen smarty pants twentysomethings who gather annually from eight states, including California and New York, has dominated the competition in recent years. The Bank, which has won four consecutive trivia titles and six of the last eight, will be among the 60 some teams expected to vie for this year’s off campus title. Joining the 8-10 on-campus teams this year will be a special team made up primarily of recent Lawrence alumni. Bigger. Stronger. Faster. That is how Roberts promises to make this year’s 40th trivia contest. To help celebrate trivia’s 40th birthday appropriately, Roberts has organized a special “pre-contest” party Friday, Jan. 28 from 7:30-9 p.m. in Riverview Lounge of the Lawrence Memorial Union for all the trivia teams to gather and meet each other prior to waging their battle of wits. New Lawrence President Jill Beck will make her trivia debut by asking the contest’s opening question, which by tradition, is always the final “Super Garruda” question from the previous year. All those paying attention should be able to start this year’s contest with an easy 100 points because they will know by now what casts a shadow on Jesus in the DeBakey Room in the Methodist Hospital in Houston, Texas. Last year, no team was able to correctly identify the cupped hands on a sculpture of Dr. Michael DeBakey as the source of the shadow. For additional information on the contest or how to register, visit http://www.triviaxl.com. 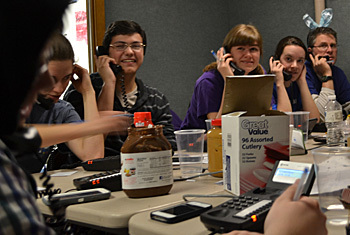 In addition to being broadcast on WLFM, the entire contest also will also be webcast at www.lawrence.edu/sorg/wlfm.